An External MIDI Instrument sends the track's MIDI data to a MIDI Out device. This can be either a MIDI (or USB) connector, a synth on the soundcard, or a software emulation of such a device. The large display in the Patch section shows the name of the patch. Clicking the Select button lets you select a patch by name. The names are stored in a Patch Map file. The 'hamburger' button menu can be used to select the Patch Map file that corresponds to your MIDI device. The Bank:prog display indicates the bank (optional) and the program used. Bank and program are numbers (0..16383 and 0..127 respectively) separated by ':' (for example: 1:2 means Bank 1 and Program 2). The bank/program value can be altered by left clicking it. Pressing Enter will accept the new value. Pressing Esc will cancel the operation. You can use the Page Up/Down and Up/Down Arrow keys to change the bank and program values. Channel indicates the MIDI channel being used. If this channel is a special percussion channel (according to the Patch Map) the Percussion Channel button will light. This button can be used to toggle between the percussion channel and a non-percussion channel. 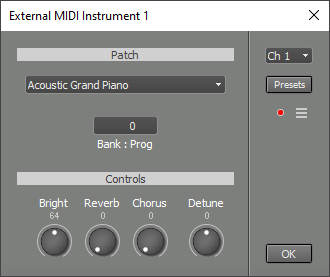 The button doesn't appear if the MIDI Out Device doesn't have a percussion channel. The Controls section affects the way the patch sounds. Detune detunes the patch using Pitch Bend messages (the pitch bend range is assumed to be 2 semitones). The value is stored in the MIDI file as RPN 1. Bright, Reverb and Chorus control MIDI controllers 74, 91 an 93 respectively. Some synths (e.g. SoundBlaster Live!) may need to be set up properly in order to respond to controllers 91 and 93 (Reverb and Chorus). Controller 74 (Brightness) may not be supported by your synthesizer. A MIDI Out Device can be either a MIDI connector or a synth on the soundcard. MultitrackStudio Pro supports four devices, lower editions supports two MIDI Out devices. To select MIDI Out devices go to the Studio menu's Devices window. The MIDI In and MIDI Out device are connected by default (messages received on an incoming channel are forwarded to the corresponding outgoing channel). When a software instrument is used in record mode the MIDI In channel being used is disconnected from the MIDI Out channel. Note: Interconnecting a MIDI In and MIDI Out device creates a loop that will slow down (and ultimately halt) your computer. MultitrackStudio will detect this loop and disconnect the MIDI in and out devices in order to avoid freezing the computer. A MIDI Out Device contains 16 MIDI channels. MIDI Out devices are virtualized by MultitrackStudio, meaning that a single MIDI channel on a MIDI Out device can be used by more than one stream. MultitrackStudio will automatically take care of playing each note using its own stream's patch and controllers. Obviously, this only works if streams using the same MIDI channel don't play notes at the same time. All other controllers do not have a default value. If they are used in one stream they should be defined in all other streams using the same channel on the same MIDI Out Device.